The Natural Minor Scale – the Ultimate Shortcut! Home / Bass Bits for the Brave / The Natural Minor Scale – the Ultimate Shortcut! Now that we have looked at my ultimate shortcuts for the major scale, look at the minor scale. Make sure to check out this blog post on notes as well as this one on the major scale, in case you missed these posts. Major and minor scales are related! Start a major scale on the sixth scale degree and declare that note the root – there is the relative minor. Relative scales share the same key signature (ie accidentals, ie notes, the same seven notes! ), but they start on different notes. 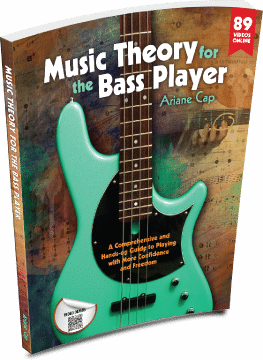 Take a look at the info guide below for a super useful shortcut on the bass – how major and minor scales are related! Here again is why I don’t promote WHWWHWW. to think of the notes in the scale as intervals with the root. Each note is now accessible to you for improvisation – in the context of the scale! Knowing a scale that way also allows you to make judgments about the sound of each note within it before you even hear the note. Without further ado: enjoy my famous short cuts to minor scale mastery. I am also adding a few sample scales below the helpful graph. Then you try a few! Apply the rules 1 – 2 – 3 and you can never go wrong.